Although we’ve been getting brief glimpses of springtime lately, the snow showers, wind, and rain are keeping the ground firmly frozen. 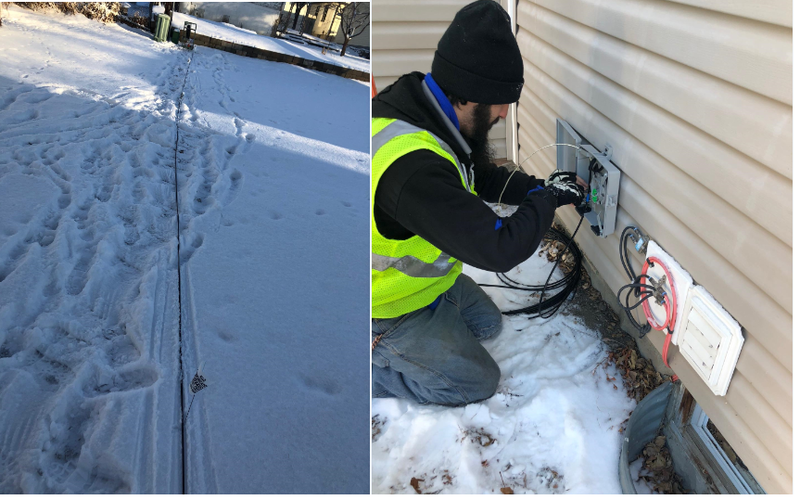 These chilly conditions mean our team must place a “temporary drop” for ALLO customers who install service in the winter and early spring months. 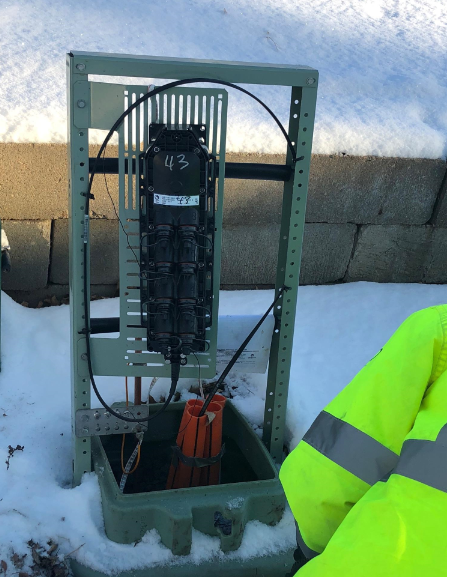 Rather than burying the fiber optic line as we do in the spring and summer, a temporary line is placed above ground until temperatures rise and the ground finally thaws. Social media specialist, Dalena, had the opportunity to ride along with the ALLO drop crew recently, so we’re thrilled to share a closer look at the temporary drop process. She started the morning with a quick team briefing and a group photo in the Lincoln warehouse. When they arrived at their first drop assignment, Dalena got an up-close view of how the fiber connects to the pedestal via the Multi-port Service Terminal (MST). MSTs are essentially the optical taps where we plug in each customer’s fiber optic drop. An MST can have two to 12 ports, and every port for each MST is assigned to a specific customer address. Next, the fiber optic line was strung across the yard and connected to the box on the side of the house. Two days later, the customer at this temporary drop location was happily lit up with ALLO fiber service. Understandably, many customers are anxious to get this line buried. Like so many other ALLO construction efforts, the drop process is entirely dependent on weather. 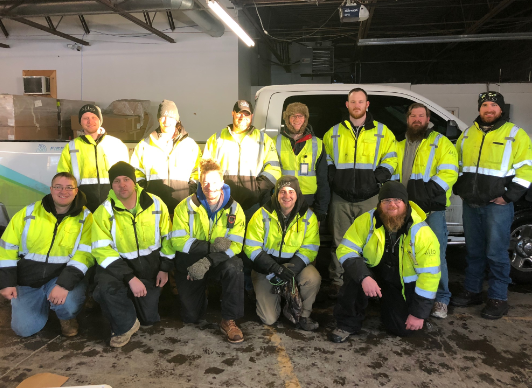 Construction teams across all of our ALLO communities are hopeful that Mother Nature will be kind so that we can get to work burying the temporary lines soon. When the ground thaws and weather conditions allow, our support team will be in touch to give you notice of the burial and explain how the process works. Stay tuned; we’ll be sure to send Dalena out for another ride-along and get a closer look at the spring bury process.